In the previous article, I explained how to simplify your finances by just completing a few simple exercises on a piece of paper and I explained the three scenarios that you are probably in right now. So let’s continue our discussion right now. If you are currently in Scenario 1, you would want to move up to scenario 2 and scenario 3 immediately right? And if you are in scenario 2, your end goal is to get to scenario 3 as soon as possible. So here’s what you do about it. Don’t worry, I’m not going to tell you to just live below your means as this is what 99% of people try to do and still be in this predicament. The real solution is that you must work on the two problems together, not just lower your expenses, but work on increasing your take home. In this article (Part 2) I’m going to teach you how to first fix your spending habits, then in the next article (Part 3) We will tackle how to you start increasing your income. So let’s talk about expenses first. As the picture shows, the first thing you need to know is that there are three kinds of expenses. Buying Items that cannot be re-sold at same or higher values. Notice that I included Savings, Investing, and Insurance as “expenses” this is because with my method, everything that goes out of your “cup” I treat as an expense. But, in this case, it is a good kind of expense. Good luck and I hope to hear from you soon! 1. Scroll down to the bottom of the article, leave a comment and participate! wow!what you say is true.it means that we need to concentrate to important things first.be practical or clever. Thanks Michael, hope this article changes your life for the better. Do let me know if you are able to do the exercise and the results in about a month. Thank you for this helpful article. I now have a more concrete idea on how to handle my savings and hopefully in the future my mind can also automatically filter bad, necessary and good expenses. This is what we should all learn to practice by heart if we want to uplift our lives and and help uplift the lives of others as well. This is actually plain common sense, yun nga lang in the area of money management ika nga ni Robert Kiyosaki, “Common sense is uncommon”. This kind of money management is very much doable, but it requires some strong sense of discipline. Thanks for commenting saggi. I’m glad you agree that it is doable and yes like all things in this life that is worth doing, we do need to sacrifice and build discipline. I hope that this article helps you and a lot more people. True enough. Wise people think of ways to simplify and maximize existing resources. Thank you once again for sharing this. I call this social responsibility – voluntarily extending help to others by sharing innovative techniques. Again, more power! Very good insight Benjoe! Managing money is not all fun, there must definitely be sacrifices. The process is long, hard and brutal. But, if there are people willing to change, I hope they will listen to your comment. All for the best for everyone! This will be a great guide for me and my wife. Look forward for the part 3. At this time your posted article helped me in some way! Now I can monitor all expenses that me and my husband make and consider the fact of increasing our so called take home pay even we earn very little. Thanks! Hi May, I’m glad that you have already done part 1 I hope part 2 if my article, especially the substitution exercise will help you even more. Part 3 should be out soon so stay tuned for that. Great ideas. I really appreciate what you are doing. These are practical lessons that all us should learn. I am grateful. Great ideas. I really appreciate what you are doing. These are practical lessons that all of us should learn. I am grateful. Very Welcome Fred! Glad you got to read my previous articles too! Keep Reading, Keep learning, keep sharing! Same here Fred! All the best! I’m glad that there are generous people like you sharing precious knowledge which probably others would keep for themselves. I need this and I’m so happy I read your article. Thanks and I’m looking forward in seeing you again. more power to you and your family. God Bless! Long time no hear David! Yes I do hope to see you soon. All the best, all the time! I happened to read your column today in Manila Bulletin and tried to visit your blog. I’m really glad that there is someone like you who is trying to reach every Filipino to become financially independent and make the most out of our lives. Very welcome. Keep reading, keep learning, keep sharing. Can i ask any basic book or reference which i could learn stuff like this? I would be glad if it would be not so simple but not so deep kind of book. Thx! Thanks.I will apply everything you said.You will hear from me as soon as I progresses. Very welcome Gilbert. Looking forward to hear from you soon. Hi Jon, part 3 is already available, go to our money management articles! its very basic… right?! 🙂 many of filipino’s new it already but the problem is mind setting… You know what sir… I will share this knowledge to my bro. and sisters and relatives… Iam praying that God will give you more strength and more wisdom and good health as well… Thank you sir! thank you! Thank you once again Leo. God does give me strength, but people like you, give me hope that there is still something that I can do to help. Thank you for the inspiration!!! More power to you in all your projects sir! Hi Keith, glad to have inspired you. Do come back and tell all your friends and acquaintances. I’m sure like me, they will appreciate it. Talk soon! This is a good article. I used to have 2 columns only when doing budgeting: money in, and money out (ie, expenses). I had always thought expense is just money going out. Now I know, there is such a thing as good expense. This article also interesting in that budgeting is likened to dieting- I don’t have to deprive myself of things I want, but I just have to find a more sensible expense to substitue for the bad expense. I am applying this now in my monthly budgeting. More power! Hi Jackie, thanks for writing in. I’m glad you are following my advice. It really works. i liked the part where you advised not to live just below your means but analyze your expenses and doing substitution instead of Good expenses…. useful first step in meeting one’s financial goals….thanks ! Very welcome Patty. I can see that you are really going through the articles. Keep it up! The illustrations you’ve shown make it so easy to understand! Thanks Mark! I’ll share this to my friends! I’ll definitely promote this site. Excellent. The fastest way to do that is to share this on Facebook. At the end of each article is a Facebook share button. Go ahead and click on that. Thanks! Do continue reading Money Management Simplified Part 3. Talk soon! Great article! OFW’s like me can learn a lot from you.. Thanks Glo! Question is, will you implement it in your own life immediately? I’m already very happy for you. Make yourself proud, you will succeed Glo. I just know it! To sum it up, it means self-control on spending and wisdom in planning what is necessary. In summary, it means to not just lump up all expenses as equal. There are good expenses, necessary expenses and bad expenses. Reduce the bad, keep the necessary and increase the good. It is about first understanding and forming a healthier habit on how you spend. If you just reduce all your expenses indiscriminately, it doesn’t work as that is what 99% of people try to do to become richer. And 99% of them don’t make it. i will try this out, do you have any suggestion for bad exp. so i can include it in there. Mark buying something for my wife in special occassion like birhtday is in bad expense column? . this is where i used my credit card. i usually dont buy her often unless there is occasion and most of the time its a little bit costly thats why i used my credit card for her. Buying something you don’t have cash for and cannot rent out or re-sell is considered a bad expense. However, since it is for your wife, then it is “necessary” ha ha ha. Kidding aside, just remember a bad expense is something that doesn’t bring back the money (rented, re-sold, make you more knowledgeable about money, etc.) some examples were already given in the article. Time to apply it now. Hi Sir Mark! I did the exercise. I figured I have lots of bad and necessary expenses. I also found out that i have some good expenses that I should have put to work for me. This exercise made me aware of where most of my money go. From now on I’ll always do this simple exercise so that in time this (simple money management) will also become natural with me. Thank you for sharing! God Bless. Great job! 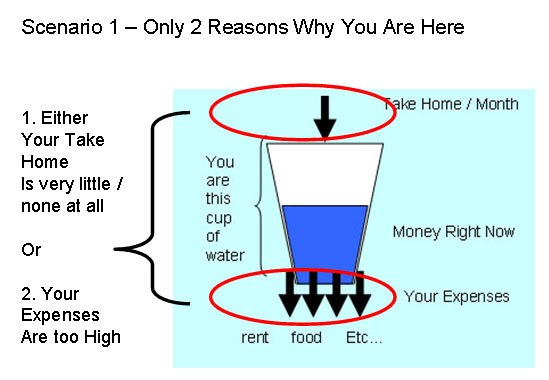 Please continue with part 3 where I give you 2 ways to increase income almost immediately. Nice article, the hard part is determining which one is bad and which one is a necessary expense. 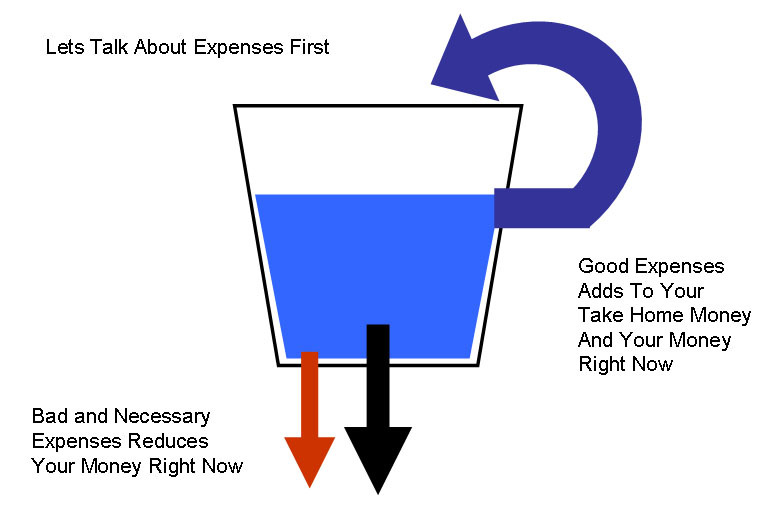 Sometimes we are tempted to justify that the bad expense is a necessary expense, which ends to an overspending. I am sometimes guilty of this. When we were able to pay off most of our cards, we ate in an eat-all-you-can resto. My justification was having to stay frugal for three years just to pay off cards, we deserve and we need to reward ourselves with eating out. Its perfectly okay to give yourself a reward from time to time, just don’t make it a habit. You ate at a buffet, not a problem, but if you do it every week, then that is no longer a reward but punishment on your finances (and your bellies;-)). Also, Like all our articles, we suggest you read this one in particular again and again as sometimes, you miss out on some things that can give you “aha” moments. 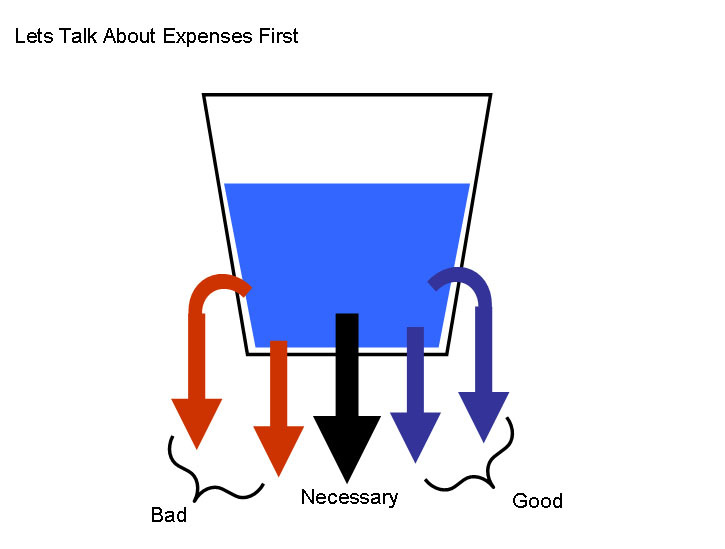 Especially the part where I explain and define what bad, necessary, and good expenses are. Talk soon! I always make it a practice on buying things, but sometimes I indulge in expensive food. Is it bad? I can’t help to eat in expensive restaurant sometimes when I crave for food. The chunk of my expenses coming from there and my health. Thanks so much for this insight! 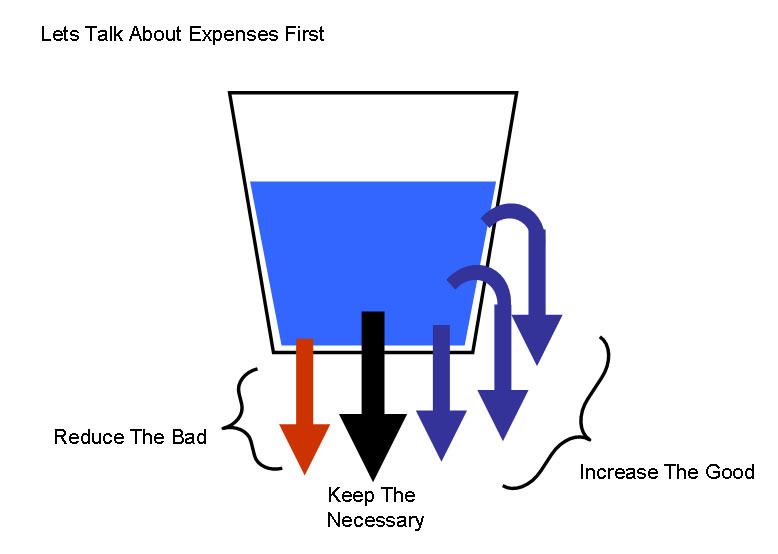 I never thought to think of expenses as bad or good…I just thought they were all necessary. Houston, we have a problem! Again!! Mark, what about a “necessary bad” expense? After having more time to think about it, it’s really a matter of determining where the expense leans more — necessary or bad? It can only be one of the two. nice article,you’ve teach as a good example of how to manage our expenses. i may now say you’re the philippines version of robert kiyosaki.it’s true it’s so easy to say than to make it done.i am thanking your good advice of choosing health insurance for sometimes when money needed a life insurance is hard to get.keep it up!!! i will keep following your blog!God bless!!! Glad you are learning Richard. Keep on reading and applying the lessons. Best! I enjoyed this article because it gives some practical tips on how to handle your money and I believe this is one of the most practical ways to do it. Through managing expenses and substituting others for those that can be substituted. Another great article. Thanks Sir Mark! Depends. If you are renting it out or reselling it then yes, if its just gathering real estate taxes and other expenses then it is not. No pain! No gain! Your explenation is very remarkable. I’m sharing this to my family. Hi Mr. Mark, thanks for helping us to gain better insights on our spending habits. I must share this to my family. I am also planning to buy a laptop. Is this a bad expense? How can it generate a passive income? Hi Paul, please read the definition of good expense again. Can it bring money in? If you buy a laptop and just use it for games then its a bad expense, if you buy a laptop and can get a job as a transcriptionist using it, then it brings money in and it is a good expense. Mark, It is really what your saying, you have to make sacrifices now for the future and at the same time your changing your bad habits into good ones, very very helpful article. thanks again for showing me simple ways to change my mindset. Thanks Rafson. Is it working to help you change yoir mindset already? slowly it is mark. just have to follow through with it. This article made me think of my expenses and allowed me to classify them properly. I was thrilled at the idea of a “good expense.” So now, i will be more conscious whether or not an expense is good, necessary or bad. Besides my regular job, i also teach part time philosophy classes at a local college. Since more than half of my students are business admin. students, I decided to share your idea about a simplified money management and told them to visit your blog too. I guess, that’s just one of the ways i could pay forward your generosity to your readers! Thanks and God bless! I agree with reducing/ substituting bad expenses. But maybe indulging a bit will be ok to give oneself more motivation. just the advice that i need sir mark, GODBLESS YOU!!! I’ll try to comply what you taught to me.. This is an eye opener for me to the right mindset. with this article, i will try to increase my extra income. i like that expense that could be rented out or resell. actually, i’m doing this thing but can’t manage. i will try this activity for a habit. These amaze me. i didn’t think before that these can be possible. i cant wait to share it to my husband tonight.. This is an additional know-how. im thankful. Yup! Really simple but quite hard to do for most people, particularly the impulsive ones. In my case, I know I can do this. I just need to be focused and determined. Thanks again Mark & Jhoanna! Now, I’m beginning to see the light! hi mr mark , i became interested with your articles since october 2o11, and during lunch or dinner with family members, i shared what i read. This will help them a lot, especially now that they are starting their college life. i will wait for the coming articles. thank you. Hi great article, but in my own view, there are some pleasure expenses that are not bad especially expenses that will create or harness bonding with your family, a modest family vacation is one of them. I for myself see to it that once or twice a year, my family get to spend vacation together, I also consider that as a reward for ourselves. But what we do is pinaiipunan namin ang get discounted fares. Bad and good expenses are fairly subjective. If your vacations lead to a better life, then by all means continue to do so, in the end, having money is really all about having a better life for you and your family isn’t it? yes, your article is very true. Most people spend today and ” bahala na” bukas. wrong attitude and lack of responsilbility. Only if you can have tagalog version, so that we can display your articles in our bulletin board for the employeesd to read. thank you. On the upper right hand side of this blog is a button that will translate the blog and all its articles to tagalog. Hi Mark! I am realizing a lot already.. I took a look at my expense diary..my goodness spent so much on food and well of course my credit cards.. hehehe. Thanks for this step. This is really an opener. I am so excited to rate all my stuffs and of course my skills. Yues, I realized I can post all my collected pictures of viands that I cooked and goodies that I baked..thanks super. God bless you and Jhoanna. Learned a lot in this article re good and bad expenses. Now I have to redo my budget. Good. Let us know how that goes. Very true! Thanks for sharing. Hi Mark, the insight is very very remarkable because it really strikes my way of spending. I know that it should be done both by both couple to succeed. I would like to ask if there’s an e-book that I could download your articles? Particularly in “Money Management Simplified” and “Making Money run After you”. Hi Aidan, thanks for asking, none at the moment. Will probably come out with one as soon as my schedule permits though. Make sense, but how about expenses like buying a TV? a car? You can sell them later, but surely at a lower price that the acquired one. Without TV, there will be a tendency to go out during holidays and spend unnecessarily. Right! Ok, I’m rephrasing my last comment from part 1…it should be AND not OR. hehehe tama tama. This will be a big help as I am an impulse buyer. From now on,I will practice your technique. Good luck to me Mark! Thanks for confirming what I believe that we should concentrate on having extra income instead of reducing necessary expense. This is a really great advice… I started to apply the 10-20-70 percent lifestyle approach, which 10% percent belongs to God, 20% for my savings and investment and 70% for living expense. It is not really easy but I’m still ok, and I believe in what I am doing. This article confirms it. Keep the good assets growing and lessen the bad expenses. No excuses on doing that. This is an eye oprner for me because it is our habit to dine out every Sunday. From today onwards, i just cook a good meal for the family. thanks for explaning so well on your article. what a good start to spend money wisely! Great article and a reminder! As always, thanks for this. The hardest thing to do is to start… kicking back bad and old habits of spending on impulse and instant gratification. i got a lot of substituting to do i think we have this habit of spending money on bad expenses so better keep moving before its too late. Now I know how to classify expenses. My next move is to prioritize these expenses. my main income stream and additional income stream. Well done!!! Another great article, surely if applied will make a difference to one’s life. Expense Management through Substitution makes so much sense. I love the illustration. Genius. Hi Mark! This is worth doing. Thanks! nice thought in disciplining your spending… whether a need or a want. time now to reduce the want or bad spending. thanks! I love the way you make it so simple, yet detailed, for us to easily understand what you are sharing to us. Hi Mark, it requires a change in mindset to modify spending habits. I do appreciate your explanation on expense management. However, bad expenses are resorted to like eating out or going on a vacation as they are seen as excellent forms of relaxation. I think these type of activities may be classified as necessary if they are programmed. What do you think? I’m learning a lot from your articles. Thanks. Relaxing through eating out or other “bad expenses” are not necessarily bad, in fact they can re-energize you and make you feel better. However if you cannot afford to do it frequently, then it is about time you learned how to substitute it with something else that helps you become wealthier. All work and no play is not good, but playing when you should be working is worse. In our present situation, there’s a lot of things that has been offered to us to improve our everyday life. Sometimes we perceived it as important, well in fact its not. Sometimes we tell it to ourselves we need it, but in reality its not. Every expenses should be weigh first before we execute the buying. If you have a second thought on something that you intend to buy, then you don’t need it. But if you don’t have a second thought, try to stroll first and find a product that offer a lower price but same quality. Every one want’s to be in, so they buy on something that they already have. Right now, we have to be more clever in our expenses. Thanks for the tips Ruel. I’m sure everyone else would agree with you. Great article. I think I can minimize my expenses more by using the tables. I also realize that I should not take out loans without actually needing it. I should not get a loan just because it is available for me to take and then putting it in the bank for the sake of having extra money. Yup. Never take out a loan if you cannot generate positive returns with it. Never take out a loan if you really don’t need it. Your examples are very clear. Now we know where to focus. There are times that we really need to cut down our unnecessary expenses in order to turn around with great results. Thanks for the insights. 1. Is it nice to have only ? 2. Do we need it ? When finances were a just a little bit getting better, I was able to buy a Life Insurance in addition to our ( with my wife in the same Company ) Company’s insurance provision per CBA. I did not buy a health insurance since the Company provides the 100% medical care for employees only. My savings was via subscription to the Company’s Stock Option Plan ( where it netted us 1000% after 10 + years which subsidies our children’s educational / health expenses ). Nice article. With the “Substitution” process,you get to enjoy the usual things and still able to save without the feeling of being deprived. To the extent that you make money run after you Hanz. Its about being of value more than anything else. I totally agree to minimize the bad and increase the good expenses. This method should be agreed by the couple and educate/inform the children as well. I am really blessed to read this kind of article. This is really beneficial to the reader. Nice to hear that Jess. Please do keep reading and commenting. I agree! My husband and I are better with keeping the bad expenses at minimum now that we have a baby. We are also now finding ways to increase the good expenses. It’s great to know that what we’re doing right now to increase our “wealth” is validated by this article. We did the table and listings of our bad expenses and made a substitute either for necessary and good expenses. I am excited to see how our good expenses will turn into additional take home and increase our money right now. You gave me hope. I always end up at the break even mark every pay day. Sad , my savings drained… I need this. Thank you… I look forward to being in control of my finances. It is really educational for everybody .i willpractice this system. Thanks sir mark! From now on i will lessen my bad expenses thanks for reminding me. I needed this. I must reduce or eliminate my bad expenses ASAP. Thanks, Mark! Thank you Sir Mark for sharing this with us. Wise management of finances can bring us true wealth. What are your thoughts on my frequent travels if I can afford it? Is that still considered as a bad expense? How simple and I can´t believe how almost no one knows about this. It´s a blessing for me having known this SIMPLE and wonderful money management system. nice sir!. well said. i’m excited in applying these ideas in real life. I am so grateful for sharing this.. It will be a big help to everyone of us, I really appreciated it and will apply it also to myself. Fantastic. This is really a great article you wrote sir Mark. Simple and direct to the point. Blessings Sir Mark. Thank you sir it really makes me think and ask myself what my priorities really are. This requires some soul searching. Npakapraktikal at hands-on kinakailangan po talaga ito sa buhay. So true Sir Mark.in fact i already started on investing on rentals.We can also enjoy some simple pleasures in life provided we continue on adding to our “cup” regularly so that our hard-earned money will grow and eventually it will work for us and not the other way around. Thanks for the very informative article! GB! Hi All! I decided to start this blog to share my business and investing experiences for those who want to help themselves. So for those reading this post right now, welcome! Let me first start by saying that I did not take up commerce, business school or any formal financial training, my experienceBusinessmaker Academy, Inc.
My wife and I used to live in a condo unit when we were newly married. At first, the condo was pretty spacious and needed some furniture so we got a little bit of this, and a little bit of that, then gifts would come from friends and family onHow to Build Businesses using the Power of Accumulation! "hello sir! it's been awhile since i attended your class (7 point) 2 years ago. :D since then, i started a small retail business up till now. so far so good. :D and your blogs help me a lot. :D thanks a lot for keeping in touch. :D i am thinking of taking another class from u but i am still managing my schedule. as u can see, i still have my day job, taking my doctoral degree at night and managing my business. :D i am looking forward for more blogs! more power and God bless u always :D thank you :D"
You never run out of good articles , I learn a lot eveytime I read your articles. Hope to visit you at your office in the near future." "expanding your means and not living below your current means is a great financial advice....thank you for sharing these specific step by step approach.These articles should be part of a school's curriculum.Looking forward to learning a lot from you and your company...and expanding our means too.... :)"
"Nice article mark.You're right! Decreasing the product price isn't the solution to boost your income. It also downgrading the qualities of your product if you choose to give discounts to the customers.Better to offer them excellent service instead. More power to you.Thanks!" "I agree with you Mark when you said that everyone starts at zero and experience is the best teacher of all. I have met people who consider themselves guru in money matters and gives free advices even if they do not have the experience and knowledge to back it up. When I decided to go into forex, some people advised against it saying its too risky, ill lose money, stocks are better and so forth even if they don't even have the basic background how forex trading really works. Now that I'm into forex I have learned that gaining experience can sometimes be painful since you will most likely learn from your mistakes and you really have to rise from your failure and try again. I still consider myself work in progress in regards of my forex trading however I would prefer it to be this way than to just say forex is risky and you will lose money and pretend that I know what I am talking about. Anyway, loving and enjoying your articles :) More power!" I am a retired seaman and my wife has stopped working since we got married 23 years ago.. I am now thinking of how I can manage my hard earned money before it gets depleted before I reach the age of 60. It's nice to know that there are blogs like these to help people be financially independent. I think my wife & I have to really sit down, talk & apply these methods in our daily lives. Thanks &; Have a good day!! More power !!!" this specific article helped me a lot, i mean it really gave a total illumination to me. i am a graduate of batch 2009, currently i am unemployed but i am a part time academic tutor. me and a friend of mine from college entered also tshirt printing business during college, but it was a total flop! but we are planning to re-start again with the help of the lessons gained from past mistakes and from your blog. i pray that this time it will work out! :)"